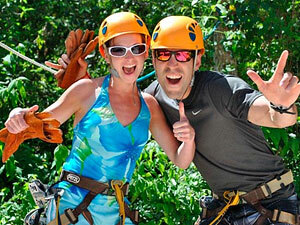 Our excursion begins with pick up at the lobby of the hotel, going just 40 Minutes away from Cancun or Playa del Carmen. Upon arrival, all guests are greeted at the Casa Zatara, with W/C, lockers, restaurant deck & bar, all in a unique ambiance. After check-in, our first activity will be in our Polaris Ranger RZR, an all terrain buggys, to rally through our magical pathways in a 30 minutes adventure in the middle of the Mayan Jungle. Our next experience will be the Extreme Canopy Tour, our circuit includes 12 zip lines of 1.5 miles long, where guests will be able to admire the great vegetation and the awesome fauna of the region. The next activity will be our famous Skywalk, a circuit of 8 hanging bridges that will thrill our participants, with a high rope trail that make balance and coordination a fundamental on this track. Next you will be a Tarzan boy in our Bungee Swing, a 12 meters rope swing where you will feel like a monkey. Continuing with our adventure in our Tarzania Coaster, 700 meters of a wild ride in a human coaster, which will make your adrenaline pump to the maximum. Next you will feel like a Super Hero, in the fastest zip line in Cancun, our Superman Zip Line, 50 meters high and 350 meters long sensation were you can reach 50 miles per hour speed that will make you fly above the Mayan jungle. The next step is to go to the crystal water of our cenote Balam, swim and refresh yourself, while experiencing this natural wonder, then ride back to our palapa where complimentary lunch and water will be served, Photos, videos, snacks and souvenirs available on our premises. Childs under 8 years are not permitted.